Jayne, aka Kay AJ Hasley, is a four year old black female born October 29, 2013. Her sire is Last Outlaw and her dam is WW's Keepin Time. 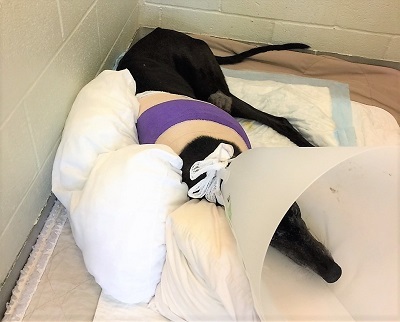 Jayne has no races to her credit on Greyhound-L. Jayne was seen by a good samaratin in Mansfield for several days who was not able to catch her until she was hit by a car. She was taken to an emergency hospital, who then called GALT. Jayne has a severe broken left shoulder, with multiple lacerations on her body. Dr. Jeff Ellis of VCA Preston Park Animal Hospital examined her and immediately referred her to Dr. Bob Radasch of the Dallas Veterinary Surgery Center. She is being kept as comfortable as possible with this severe injury. Surgery is planned for Monday, January 22. Please keep Jayne in your thoughts for a successful surgery - this is a very difficult break to repair. It is not known at this time if Jayne is cat or small animal tolerant. Check by here for updates about her progress. It was detected that Jayne had a significant heart murmur along with more severe internal injuries that could not be overcome. After going into cardiac arrest she was peacefully helped to cross the Rainbow Bridge. Run fast on winged feet, sweet Jayne. The special medical treatment cost needed by Jayne is why the Miss Mesa Fund was established. If you would like to help with Jayne's care, please take a moment to make a donation to the fund. You WILL and CAN make a difference in Jayne's life and the lives of other greyhounds in need of special medical care. Your help and support will make a difference - one greyhound at a time. Please note Miss Mesa Fund/Jayne on your check.